I live in St. Louis. I may not have been born and raised in this wonderful city, but it is and will always be my home, whether I reside here or not. When I moved here for a job after college in August 2001, I knew no one and knew nothing about my new home. I was alone, scared and in need of some feeling of belonging. Unfortunately, that was soon to come in the form of one of the greatest tragedies our country has ever experienced: 9-11. I had the privilege of working at the St. Louis Post-Dispatch on the day that 9-11 befell America. I arrived at work between the first and second planes hitting the towers. When I walked into work that morning, I had no idea what was going on, all I knew was that the news floor was on lock-down and people were eerily quite. To say that the experience immediately related me to my fellow St. Louisans is stretch, but it was a large part of the glue that bonded me to this great city. But before things change in my hometown forever, I would like to talk a little bit about what it is like to be living in such a political hot spot. My family and I live in St. Louis. 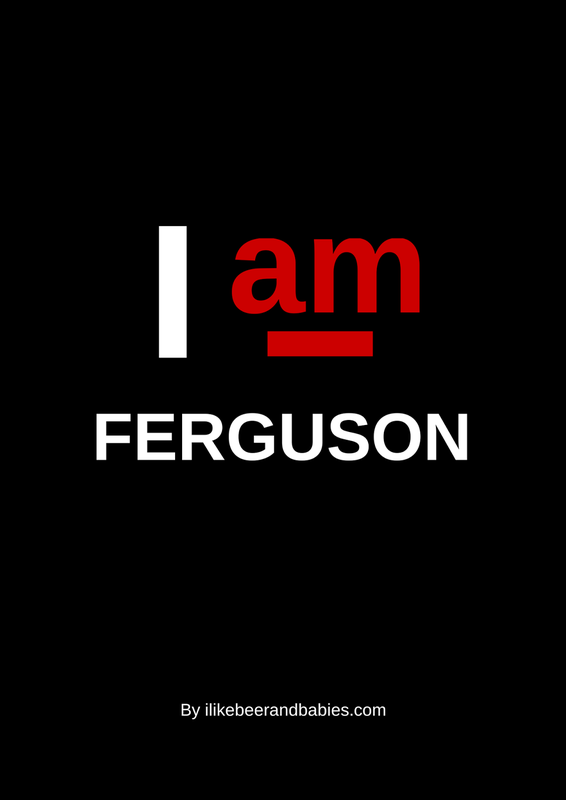 My husband is a teacher in Ferguson. As a person who suffers from Post Traumatic Stress Disorder (PTSD), this entire situation has been one huge trigger for me. Every day, people in St. Louis wake up scared for when the grand jury announcement will come out. We don't know what's going to happen. We don't know where it is safe to go. We have been advised to stock up on food and supplies because it may not even be safe to go to Target (talk about first world problems). My husband waits daily to hear whether he is to report to school or whether school is canceled indefinitely due to Ferguson no longer being a safe pace for children to learn due to the violence erupting there. With the Michael Brown grand jury announcement hanging in the air like a thick cloud of poison waiting to descend upon us at any moment, my great city is at the crux of something bigger than the people who make up this thriving metropolis. It seems that people from across the world have made up their minds one way or another on what happened that fateful afternoon in Ferguson. The problem is, only 12 jurors and a handful of people connected to the jury have all of the facts. Others see a Facebook post or a tweet from Anonymous and believe it as the word of God. I've even seen someone I went to college with post a photo of a police officer macing a child and saying that it happened and Ferguson. It happened in Brazil. In 2011. Things like this are not helping. There are real people stuck in the middle of this and hearsay and misinformed judgment are hurting the good people of Ferguson. The people who are protesting a corrupt and racially biased justice system and the mistreatment of America. But 99% of the people who are protesting are doing so in a peaceful and productive manner. No matter what the announcement comes out as, what happened was wrong. No matter what the grand jury decides, lives will be ruined. Whether Darren Wilson used excessive force or Michael Brown attacked the officer doesn't really matter. What matters is going forward in a way where things like this don't happen at all so there is no gray area. There need be no sides. The only side we need is one for change. One that, going forward, things like the killing of Michael Brown, no matter what the logistics of the actual incident were, are black and white. Not in race, but in facts. Whether a young black man used force against a young white officer or a young white officer used force against a young black man, we need to create an environment going forward that allows both of those individuals to thrive and survive without fear of the other. I don't have all of the facts. I am not one of the 12 men and women who were chosen to take in all of the information and make one of the hardest decisions asked of Americans in decades, so I do not have a side. Because without all of the information, picking a side is just conjecture of my own beliefs on a very volatile situation. All I know is that no matter what decisions comes down from those 12 people, my city and our world as we know it is about to change. For the worse for a while, but eventually, I can only hope, for the better. If you comment, please do so respectfully or I will drop your comment like a hot rock. This was really interesting to read because I'm so disconnected from all of it being only privvy to what's reported in the media. I had no idea that your husband was waiting for a call to see if school if cancelled indefinitely and that the reality of something like that happening was so serious. I hope that regardless of the verdict, your family stays safe. Thanks, Julie. I am also a st. Louis transplant, sitting on pins and needles, stomach dropping every time something "breaking" comes in from the news. I feel like the media has really perpetuated this situation, focusing so much time and energy onto the negative, further dividing the city. I am ready for the announcement, and hopeful we will move forward peacefully. So damn good. Sharing like a MO-FO.